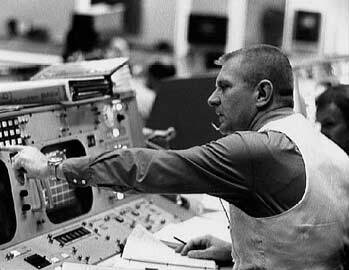 Eugene ('Gene') Kranz was a NASA flight director for the Apollo 11 lunar landing and head of the Tiger Team for the successful return of Apollo 13; he was memorably portrayed, wearing his trademark white waistcoat, in the Tom Hanks film of the ill-fated third moonshot. After receiving a B.S. in aeronautical engineering from Parks College of Saint Louis University (1954), Kranz was commissioned in the US Air Force and flew high-performance jet fighters. In 1960, he joined the NASA Space Task Group at Langley and was assigned as assistant flight director for Project Mercury. He served as a flight director for all the Gemini missions, was appointed division chief for flight control in 1968, and continued his duties as flight director for the Apollo and Skylab programs before being assigned as deputy director of flight operations with responsibility for spaceflight planning, training and mission operations, aircraft operations, and flight crew operations. In 1983, Kranz was promoted to director of mission operations with added responsibility for the design, development, maintenance, and operations of all related mission facilities, as well as the design preparation of the Space Shuttle flight software. Since his retirement from NASA in 1994, he has been involved with consulting, motivational speaking to youth groups, and lecturing on manned spaceflight. He also serves as flight engineer on a B-17 Flying Fortress that performs at air shows throughout the United States. His autobiography, Failure Is Not an Option: Mission Control from Mercury to Apollo 13 and Beyond, was published in 2000.